The little roadster gets a fitting farewell. 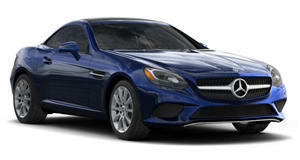 The Mercedes-Benz SLC may not be long for this world. But before its creator puts it to pasture, it's giving the little roadster a fond farewell with a special Final Edition. The end-of-the-road special will be available in both SLC300 and AMG SLC43 specs. The SLC300 Final Edition comes in Selenite Grey with the AMG Line package fitted as standard, encompassing sportier bumpers, a lowered suspension, and upgraded brakes. Inside it's done up in two-tone black and silver Nappa leather with grey topstitching and seatbelts, sport seats with carbon-look inserts, a flat-bottom steering wheel, and bright aluminum trim. The SLC300 comes with a 2.0-liter turbo four rated at 241 horsepower, sending it to 60 mph in 5.8 seconds. The only other version offered, the Mercedes-AMG SLC43, packs a 3.0-liter twin-turbo V6 good for 385 hp and 384 lb-ft of torque for a 4.6-second sprint. Its Final Edition is painted in Sun Yellow, reminiscent of the Yellowstone color that appeared on the first SLK (as the model line was initially known) back in 1996. The bright paint job contrasts with the glossy black exterior trim, riding on matte-black 18-inch alloys with yellow rims, with an interior treatment similar to the SLC300's. Both feature special badging and optional equipment bundled as standard, and will reach dealers Stateside sometime next year, with US pricing to follow. Though it could still surprise us, Mercedes isn't expected to replace the current SLC – and we can hardly blame it. While BMW is rolling out a new Z4 and the Porsche 718 and Audi TT are still going strong, sales of the little Benz roadster have plummeted. 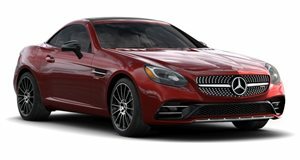 From a high-water mark of nearly 13,000 in 2000, Mercedes sold fewer than 2,000 SLCs in the US last year – making it one of Daimler's slowest-selling model lines.